A 3.5 x 4 inch square corner back spa massage magnet serves as a very affordable and powerful marketing tool for spa owners. There are lots of spas which offer wide range of beauty treatments, but only few specialize in such services. 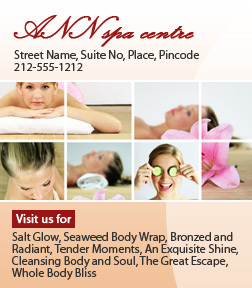 Advertisers offering back spa massage treatments can definitely seek these magnets to gain easy attention. It offers them improved visibility and gently cradles a thought of favoritism amongst viewers.